eek alright. What if they climb into your car and run over your hand when you're driving?? You will perhaps be introducing an eradication programme? Yes. I vacuumed up one of these from my couch today. They're truly out and about this time of year. Beautiful photo of a beautiful creature - hard to get such clarity when they spin themselves into veils of silver, and the egg sacs look luminous. Go figure. The big hairy harmless spider sends me into nervous breakdown territory, but these ones have me going 'ooh, pretty'. Naomi, I feel exactly the same way, and that's why I couldn't bring myself to kill it. 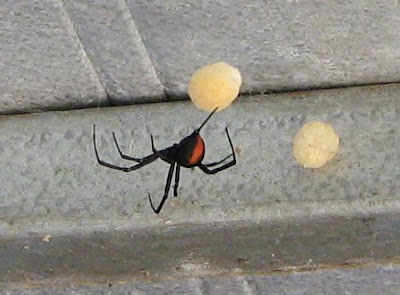 I mean look at the lovely hard-working thing, it hasn't even finished that second egg sac -- and I cleaned a whole webful of them out of the same place only last week, so the poor thing's had to go through the whole reproductive schtick all over again, and in this weather, too. Deborah, I'll come to my senses and get rid of it soon enough, if I can bring myself to. Librarygirl, the car lives in the driveway; the garage is more of a Shed. It's a long story. Elsewhere, the couch? Aaargh. What do the cats think? One of these days you'll walk into the garage and find it's written, in large friendly letters in its web, EXCEPTIONAL! It's kill on sight around here, but then, we have three childrenm plus sundry visiting children. Too big a risk for them, 'though possibly not so much for me. Deborah, oh Goddess yes. The one in this post would have got squasherated on sight even if it hadn't been heading for my right hand, before it bit a precious cat on the nose, much less a visiting child. This is just a spidery old house, I think -- I've found white-tails inside too (though not lately) and you can bet your boots I kill them on sight. You Aussies are so brave! I'm with Deborah. I used to have a breeding colony in the garage. Every few months I'd round up the survivors (they eat each other in the egg sac)and take them off to the Commonwealth Serum lab (who sadly kill them to make antivenom). They were always pretty timid, and they do look so lovely and shiny.